Magnetism and gravity are not similar concepts. These two concepts or terms are totally different from one another. Although both are considered forces, they are two different forces with different properties and characteristics. First of all, gravity, as a distinct force, acts between on two objects no matter what their compositions are. As long as the objects have mass, gravitational forces will act between them. Any two objects, as long as they have mass, will be pulled towards each other if there is gravity or gravitational force. In contrast, magnetism primarily depends on the specific properties of the object. The force of magnetism has two directions. It can pull objects together or it can also pull them away from each other. The behavior of magnetism is also influenced by the alignment of electrons inside the objects. This is not the case with gravity and gravitational force. With gravity, all objects with mass are sensitive to its force. With magnetism, only few objects are sensitive to its force. In fact, the majority of objects on earth are insensitive to magnetism. While all objects on earth are affected by gravity. To visualize this phenomenon, if an object is not sensitive to gravitational force, then it will be ejected from earth all the way to outer space. Gravity is unique to heavenly bodies. Stars, planets, and satellites have different levels of gravitational forces. Meanwhile, magnetism is naturally occurring to some ferrous objects or materials. And only few magnetic materials are ferrous objects. There is a big difference between magnetism and gravity. You should not mistake these concepts as one and the same. Gravity affects all objects no matter what their compositions and properties are. Even plastics and wood can be affected by the force of gravity. On the other hand, magnetism only affects specific objects. Some objects are insensitive to magnetism while others are highly sensitive to the force of magnetism. Mabelle. "Difference Between Magnetism and Gravity." DifferenceBetween.net. 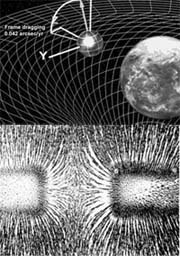 November 8, 2018 < http://www.differencebetween.net/science/difference-between-magnetism-and-gravity/ >. This is inaccurate and misleading. Often science is a matter of perspective, so I challenge with the following. What force binds or attracts particles together to make Mass? On a greater scale, would that not then be gravity? Do you totally eliminate the possibility of magnetism? Since I am neither a Mathematician or physicist, I am at the mercy of a more educated elite. So, what are my thoughts on the difference between magnetism and gravity? My analysis! It’s that it is nothing more than a property of a physical dichotomy originating from the same source. Since we can only theorize that each atom in the universe possesses magnetism, it is natural to assume such. But since we only have samples from our moon and Mars, nothing is conclusive. Then, there is a hypothesis dating back to Newton’s time stating gravity to be a fact. But is it? Take for instance the asteroid belt between Mars and Jupiter. Why is it there? If gravity or magnetism was the ultimate controlling factor, that belt would have coalesced into either planet Jupiter’s or Mars orbits. Why not? Balance! Who knows when the asteroid belt was created? The fact is, after perhaps a few billions years, there exists an almost perfect balance between speed and the magnetic attraction between the different factions. Personally, I believe we tend to complicate things too much. is something still missing from this picture…perhaps gravity is some what positive ,ther e has to be something negative that count erbalances gravity…could it be dark matter…or something of a spiritual nature cant continue my computer is acting up.